Although hundreds of miles of these ancient “cast up” roads have been identified and studied throughout Mesoamerica,13 a laser technology known as LiDAR has recently revealed previously unknown networks of highways.14 This development shows just how easy it is for even prominent structures to go undetected beneath the dense jungle foliage in Mesoamerica.15 It also suggests that many more miles of ancient highways are just waiting to be discovered under the forest canopy. Guatemalan LiDAR graphical image, showing roads. Image via National Geographic. With these details in mind, it is possible that the Nephites and Lamanites viewed highways much like the ancient Maya did—as symbolic “physical devices through which powerful forces flowed to connect material spaces and the peoples who populated them.”21 If so, this may actually help explain why the construction of major highways was mentioned in the Book of Mormon in the first place. If highways were seen as symbols of political and spiritual power that connected rulers and peoples together, then their destruction may have represented the severing of this power, as well as the breakdown of their society (see 3 Nephi 7:2). In turn, this haunting imagery, derived from the aftermath of major natural disasters,22 set the stage for Christ’s unifying ministry (see 4 Nephi 1:17).23 With these possibilities in mind, Mormon’s emphasis on the construction of highways in 3 Nephi 6:8 seems to be more than mere happenstance. It subtly sets up the fulfillment of Samuel’s prophecy, while at the same time conveying a symbolic message that makes especially good sense in a Mesoamerican context. It may be impossible to know whether or not the Nephites or Lamanites built or used any of the known ancient highways in Mesoamerica. Yet the physical forms and symbolic functions of these highways are remarkably consistent with what is described in the Book of Mormon. At the same time, they are not a feature of ancient American societies that was well-known or expected at the time of the Book of Mormon’s translation.24 For these reasons, the remnants of ancient American highways offer another intriguing evidence for the authenticity of the Book of Mormon. 1. See Justine M. Shaw, “Maya Sacbeob: Form and Function,” in Ancient Mesoamerica 12 (2001): 268. 2. For instance, see Alfonso Villa Rojas, “The Yaxuna-Cobá Causeway,” Contributions to American Archaeology 2, no. 9 (1934). 3. Mark Alan Wright, “The Cultural Tapestry of Mesoamerica,” Journal of the Book of Mormon and Other Restoration Scripture 22, no. 2 (2013): 14. 4. John L. Sorenson, Mormon’s Codex: An Ancient American Book (Salt Lake City and Provo, UT: Deseret Book and Neal A. Maxwell Institute for Religious Scholarship, 2013), 357. 6. See Wright, “The Cultural Tapestry of Mesoamerica,” 14. 7. See Book of Mormon Central, “Why Did Nephi Prophesy Near ‘the Highway Which Led to the Chief Market?’ (Helaman 7:10),” KnoWhy 178 (September 1, 2016); Wallace E. Hunt Jr., “The Marketplace,” in Pressing Forward with the Book of Mormon: The FARMS Updates of the 1990s, ed. John W. Welch and Melvin J. Thorne (Provo UT: FARMS, 1999), 196–200; John L. Sorenson, “Nephi’s Garden and Chief Market,” in Reexploring the Book of Mormon: A Decade of New Research, ed. John W. Welch (Salt Lake City and Provo, UT: Deseret Book and FARMS, 1992) 236–238. 8. See Francisco Pérez Ruiz, “Recintos amurallados: Una interpretación sobre el sistema defensivo de Chichen Itza, Yucatán,” in XVIII simposio de investigaciones arqueológicas en Guatemala, 2004, ed. Juan Pedro Laporte, Bárbara Arroyo, and Héctor E. Mejía (Guatemala City: Museo Nacional de Arqueología y Etnología), 882–883. 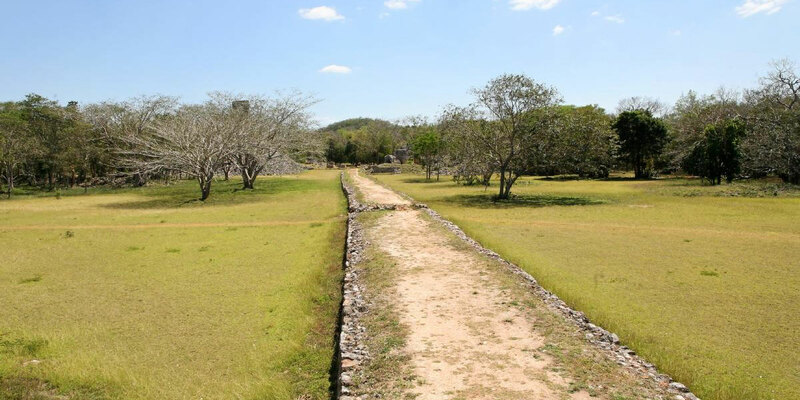 For an English version of this publication, see Francisco Pérez Ruiz, “Walled Compounds: An Interpretation of the Defensive system at Chichen Itza, Yucatan,” online at famsi.org. 9. See Shaw, “Maya Sacbeob,” 266. 10. Mormon’s three-fold poetic description of highways and roads leading from (1) “city to city,” (2) “land to land,” and (3) “place to place” is interesting because Shaw has argued that the ancient Maya seemed to have grouped their roads into three major categories: (1) local intrasite, (2) core–outlier intrasite, and (3) intersite. See Shaw, “Maya Sacbeob,” 262. Although it is uncertain, it’s possible that Mormon’s description of “place to place” refers to the “local intrasite” roads, that “land to land” refers to “intersite” roads, and that “city to city” is a description of “core–outlier intrasite” roads. Shaw explained that her “proposed groupings appear to have been a reality for the Lowland Maya. Although I do not insist that the Maya themselves would have classified Sacbeob in this manner, and I realize that the measurements and sample are a product of archaeologists’ foci, the divisions are apparently related to something in the real world. The groups are possibly related to the distance normally walked by site inhabitants in a day, the length easily traversed by participants in a ritual, or the span over which political control may have been exerted and maintained under certain conditions” (p. 266). Support for the idea that the Nephites at least conceived of one of these categories (a day’s journey) comes from Helaman 4:7: “And there they did fortify against the Lamanites, from the west sea, even unto the east; it being a day’s journey for a Nephite, on the line which they had fortified and stationed their armies to defend their north country” (emphasis added). 11. Justine M. Shaw, “Roads to Ruins: The Role of Sacbeob in Ancient Maya Society,” in Highways, Byways, and Road Systems in the Pre-Modern World, ed. Susan E. Alcock, John Bodel, and Richard J. A. Talbert (Chichester, UK: John Wiley & Sons, 2012), 137. 12. This passage is interesting because it is the only symbolic path in the Book of Mormon that is certainly described as being “straight” (meaning not crooked) instead of “strait” (meaning narrow). All other instances of “strai[gh]t” paths are more ambiguous. See Paul Y. Hoskisson, “Straightening Things Out: The Use of Strait and Straight in the Book of Mormon,” Journal of Book of Mormon Studies 12, no. 2 (2003): 62; Book of Mormon Central, “Is the Path to Eternal Life ‘Strait’ or ‘Straight’? (1 Nephi 8:20),” KnoWhy 456 (August 7, 2018). 14. See “4 Ways the New Maya Discoveries May Relate to the Book of Mormon,” Book of Mormon Central Blog, February 5, 2018, online at bookofmormoncentral.org. See also, Brigit Katz, “LiDAR Scans Reveal Maya Civilization’s Sophisticated Network of Roads,” February 3, 2017, online at smithsonianmag.com; Tom Clynes, “Exclusive: Laser Scans Reveal Maya ‘Megalopolis’ Below Guatemalan Jungle,” February 1, 2018, online at news.nationalgeographic.com. 15. See Wright, “The Cultural Tapestry of Mesoamerica,” 14; Michael R. Ash, “Archaeology and the Book of Mormon,” online at fairmormon.org; William J. Hamblin, “Basic Methodological Problems with the Anti-Mormon Approach to the Geography and Archaeology of the Book of Mormon,” Journal of Book of Mormon Studies 2, no. 1 (1993): 193–196. 16. Shaw, “Roads to Ruins,” 139. 17. Shaw, “Roads to Ruins,” 135. 18. Shaw, “Roads to Ruins,” 139. 19. See Book of Mormon Central, “What Is the Nature and Use of Chariots in the Book of Mormon? (Alma 18:9),” KnoWhy 126 (June 21, 2016). The Lamanite system of kingship is quite similar to the systems of rulership found among the ancient Maya. And it is likely that, among other things, Lamoni would have traveled to the feast to pay tribute to his father. See Book of Mormon Central, “What Did it Mean to be ‘King Over All the Land’? (Alma 20:8),” KnoWhy 128 (June 23, 2016). 20. For evidence that feasts in ancient Mesoamerican societies held both religious and political significance, see Lisa J. LeCount, “Like Water for Chocolate: Feasting and Political Ritual among the Late Classic Maya at Xunantunich, Belize,” American Anthropologist, New Series 103, no. 4 (2001): 935–953; Keith Eppich, “Feast and Sacrifice at El Perú-Waka’: The N14-2 Deposit as Dedication,” The PARI Journal 10, no. 2 (Fall 2009):1–19. Although it is impossible to know if the Lamanites held religious feasts, there is good evidence that the Nephites observed the holy days of their Israelite tradition. See Book of Mormon Central, “Did the Nephites Have a ‘Holiday Season’ Like We Do Today? (Mosiah 2:4),” KnoWhy 394 (December 28, 2017); Book of Mormon Central, “Did Jacob Refer to Ancient Israelite Autumn Festivals? (2 Nephi 6:4),” KnoWhy 32 (February 12, 2016). 21. Shaw, “Roads to Ruins,” 134. 22. See Book of Mormon Central, “What Caused the Darkness and Destruction in the 34th Year? (3 Nephi 8:20),” KnoWhy 197 (September 28, 2016). 23. See Book of Mormon Central, “Why Did the Peace Last So Long in 4 Nephi? (4 Nephi 1:16),” KnoWhy 225 (November 17, 2016). 24. It’s likely that ancient American highways were first brought to the attention of the American public by John Lloyed Stephens and Frederick Catherwood more than 10 years after the publication of the Book of Mormon. Among the many roads discussed in his travels, Stephens mentioned “a great paved way, made of pure white stone, called in the Maya language Sacbé, leading from Kabah to Uxmal, on which the lords of those places sent messengers to and fro, bearing letters written on the leaves and bark of trees.” John L. Stephens, Incidents of Travel in Yucatan, 2 vols. (New York, NY: Harper and Brothers, 1843), 1:415. See also, John E. Clark, Wade Ardern, and Matthew Roper, “Debating the Foundations of Mormonism: The Book of Mormon and Archaeology,” 2005 FairMormon conference presentation, online at fairmormon.org.